A well presented and spacious, ground floor, flat which forms part of this highly regarded building situated along Eaton Gardens in a prime central location close to Hove train station. The property itself boasts spacious living accommodation with useful storage cupboards and has the advantage of no onward chain. As you approach the building you are immediately impressed with the grounds and internally communal ways. The flat itself has a generous and welcoming entrance hall which all the main rooms feed off. 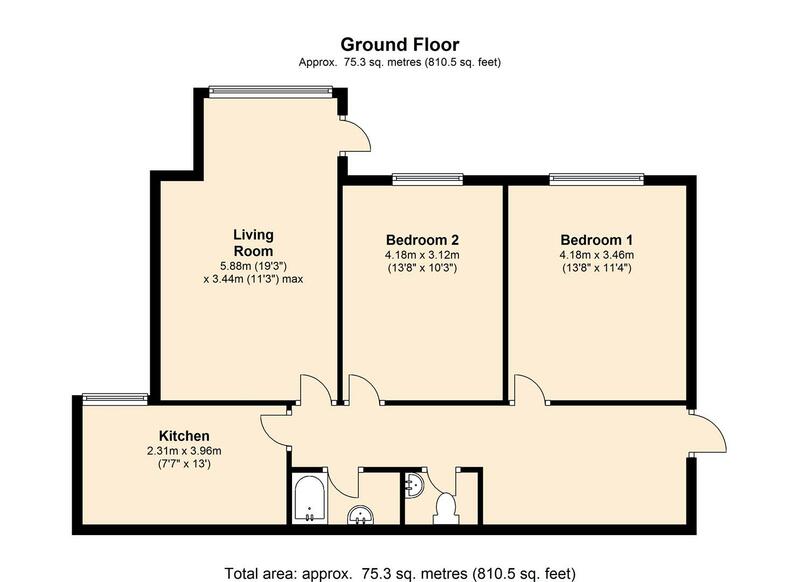 The two double bedrooms are both of similar proportions, the large living room has a delightful bay window and access to the flats private balcony. A fully fitted kitchen, a family bathroom and a separate WC make up the rest of the property which we would highly recommend viewing to appreciate the size of the flat. Outside the property you have your own private allocated parking space and use of the communal gardens and is being sold with a share of the buildings freehold. Veric is situated in the centre of Hove within close proximity of Hove mainline station with superb links to Brighton and London. A short stroll south and you come to Church Road with a large selection of shops, café’s, restaurants and bars. Regular bus services pass nearby giving access to all parts of the City.